Since the publication of Nonistopic DNA Probe Techniques in 1992, the move away from radioactive materials for research and diagnostics has continued. This is due in part to public awareness of the hazards of radioactive waste and laws making radioactive disposal more difficult and costly and to improvement in both the sensitivity and convenience of nonisotopic techniques. Several new nonisotopic techniques have been developed and substantial improvements made to existing nonisotopic methods since 1992, and these are now included in Nonisotopic Probing, Blotting, and Sequencing. 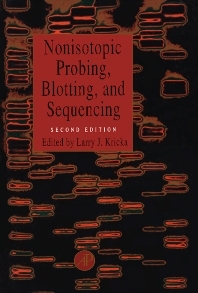 Nonisotopic Probing, Blotting, and Sequencing is an updated, expanded edition of the bestseller, Nonisotopic DNA Probe Techniques. It has been thoroughly revised to include the latest improvements in nonisotopic tagging techniques for macromolecules. Like its predecessor, it enables researchers to select the best nonisotopic method for their needs and maximize success by following its straightforward protocols. AUDIENCE: Researchers of molecular biology, cell biology, genetics, developmental biology, microbiology, clinical medicine, diagnostics, biochemistry, immunology, neurosciences, oncology, pharmacology in academic and industrial laboratories. Labels, Labelling, Analytical Strategies and Applications. Nonradioactive Labelling Methods for Nucleic Acids. Detection of Alkaline Phosphatase Labels By Time-Resolved Fluorescence. Detection of Alkaline Phosphatase By Bioluminescense. Detection of DNA on Membranes with Alkaline Phosphatase Labelled Probes and Chemiluminescence Cspdr Substrate. Detection of Alkaline Phosphatase By Colorimetry. Detection of Alkaline Phosphatase By Chemiluminescence Using NADP, Ascorbate and Indoxyl Phosphates. Detection of Horseradish Peroxidase By Enhanced Chemiluminescence. Detection of Horseradish Peroxidase By Colorimetry. Detection of Glucose 6-Phosphate Dehydrogenase By Bioluminescence. Detection of Xanthine Oxidase By Enhhanced Chemiluminescence. Electrochemiluminescence Detection of PCR-Derived Nucleic Acids. Detection of Phosphors By Phosphorescence. Detection of Europium Cryptates By Fluorescence. Detection of Lanthanid Chelates By Time-Resolved Fluorescence. Detection of Lanthanide Chelates and Multiple Labelling Strategies Based on Time-Resolved Fluorescence. Detection of Acridinium Esters By Chemiluminescence. Detection of Energy Transfer and Fluorescence Quenching. Sequencing By Nonisotopic Methods. Chemiluminesence DNA Sequencing with 1, 2-Dioxetanes. Hospital of the University of Pennsylvania, Philadelphia, U.S.A.